Almost missing his own graduation stopping a group of thugs stealing Uranium, for some unknown reason, Peter Parker (Andrew Garfield) gets to the ceremony just as they call his name. That evening, while about to have dinner with his girlfriend, Gwen Stacy (Emma Stone) and her family, Peter decides that it is in Gwen’s best interest that he stays away from her. As Gwen’s father warned Peter before he died, Spider-Man will make many enemies, who will stop at nothing to put an end to him. After an accident at OsCorp, Max Dillon (Jamie Foxx) finds himself with the power to control electricity. Confused by his new powers, and just wanting to be accepted by people, Max causes a huge disturbance in Times Square. When Spider-Man tries to diffuse the situation, things take a turn for the worse. Max’s longing for acceptance turns to anger, leaving him to become a supervillain, Electro, bent on getting his revenge. Meanwhile, Peter’s old friend, Harry Osborn (Dane DeHaan), heir to the OsCorp empire, comes back from boarding school to see his dying father. Cursed with a disease that is slowly killing him, we find that Harry’s father has been using OsCorp to try to find a way to prolong his life. When Harry takes over the company, he continues in his father’s footsteps, hoping to find a cure. As luck would have it, Richard Parker (Campbell Scott), Peter’s father had found a way to use genetically mutated spiders to create a way for organisms to heal themselves. However, when he learned what OsCorp was up to with his research, he and his wife (Embeth Davidtz) fled. They left Peter behind with his Aunt May, at the same time, making sure no one from OsCorp would be able to use his research. Harry, running short on time before he dies, he finds the one man who can help him get the cure he so desperately seeks.The duo devise a plan that, naturally, puts the entire city at risk. Will Spider-Man be able to stop them? After the first Amazing Spider-Man, I had high hopes for this latest reboot. 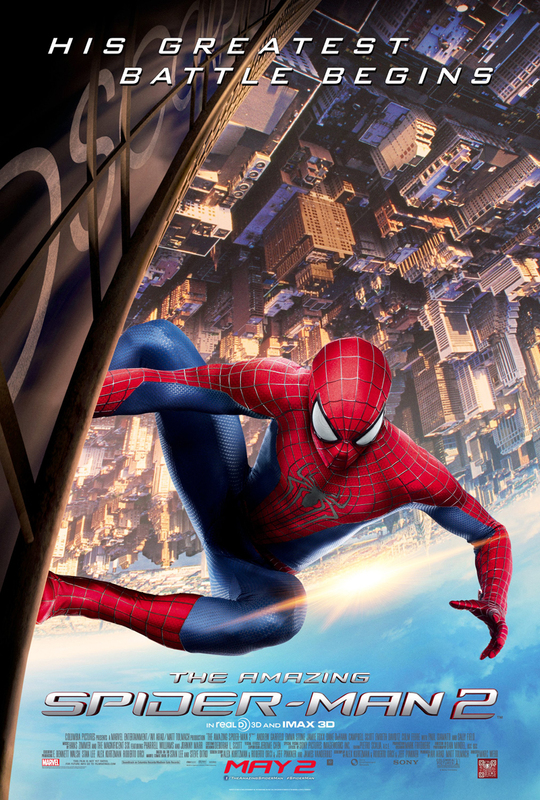 What Marc Webb has done with the web-slinger is far above Sam Raimi’s version. And Andrew Garfield swings circles around Tobey Maguire. The cinematography, in the opening sequence, specifically, is excellent. Webb gives us a swooping point of view that makes you feel as if you are riding along with Spider-Man. Especially in IMAX 3D. I really like Andrew Garfield in this role. He has a sharp wit and great timing. He drops one-liners and quips dripping with sarcasm throughout the film. It is a little reminiscent of Robert Downey Jr.’s Tony Stark, without stealing Downey’s schtick. What is missing, however, are some of the Peter Parker-esque characteristics I remember from reading the comics. Peter never really fit in. He was a small guy. More of a nerd. More like Tobey Maguire. Garfield’s Peter Parker is cocky and full of self-confidence. Also missing from the film was the conflict between Spider-Man and the police. I remember there being more tension as to whether this vigilante was really a good guy, and should they let him continue to do his thing. I guess, since he “gives everyone hope,” and seems to be the only superhero concerned with minimizing collateral damage, they give him a pass. Where we trade off some of what I think makes Spider-Man who he is, we make up for with a believable love story. I mean, isn’t that why everyone is going to see Spider-Man movies? Like, Andrew Garfield, Emma Stone blows her predecessor away. I realize they are different characters, but Kirsten Dunst doesn’t compete with Emma Stone. Aside from just an overall better performance from Emma, you can feel a real connection between Gwen Stacy and Peter Parker. Garfield and Stone play off each other perfectly. Peter’s anguish between wanting to be with Gwen, and wanting to stay away from her, for her protection and Gwen’s love for Peter, yet tired of his constant back and forth with him doesn’t feel forced and cold. Overall, the performances these two give make the film what it is. Even more so than the constant battles. Then there are the villains. Jamie Foxx does alright as Max/Electro. His alter-ego feels cheesy and overdone, but, I guess, it plays into his rise as Electro. I don’t know that anyone else would have done any better or worse. Dane DeHaan also is passable. He comes off, again, feeling a little cheesy and overdone. I guess that’s to be expected for supervillains, though. You have to get people to hate them, and do it quickly, so we can get to the confrontation and resolution before the movie ends. Luckily, they allowed plenty of time for all of that, giving it a run time of almost 2 1/2 hours. Surprisingly, though, it went by much more quickly than I expected. It didn’t feel like it was dragging. I am quickly realizing that one of the best people to take to these types of movies is that friend of yours who has read comic books for years and can tell you every minor story arc and fill you in on important details. The back stories for the villains in this movie seem a little hokey, even for a movie about a guy who is almost invincible after being bitten by a spider. (Mutant electric eels and a stereotypical German doctor? Really?) I’m told the stories are pulled from the “Marvel Ultimate” universe. That is why the Green Goblin is more of an actual green goblin in this movie than you remember from the past. It can be a little confusing if you’re not up on these versions of the stories. Towards the end of the movie, it gets a little tiresome. Three villains is too much. We tried that with Spider-Man 3. It didn’t work then and it doesn’t work now. Trying to compete with The Avengers, and all the films of this genre, it tries to become a huge spectacle to get you excited for the next movie. Since Spidey will never be allowed to join Iron Man and the gang, they have to take a different approach. The Sinister Six. The “Avengers” of bad guys, if you will. While I give Sony credit for taking an alternate approach, the movie gets a little heavy-handed trying to set this up. It’s a shame, too. They take what is probably the ballsiest ending in a superhero movie and tack a bunch of unnecessary set up after it, ruining a literally jaw-dropping moment. The only reason I suggest seeing this in the theater is because that is how these movies were meant to be seen. As I mentioned, the cinematography in the opening sequence is great. Sitting in the 3rd row of an IMAX theater, while not my ideal seat, makes you feel as if you are in the movie, even if you have to look around to see the whole screen. Otherwise, I recommend waiting until it is available to rent. It is a forgettable chapter in the Amazing Spider-Man saga. There is an “end credit scene.” Kind of. If you wait around for the very last credit to roll, hoping to see something, you will be disappointed. Sony decided to make you use the Shazam app during the credits to access it. The problem is, I couldn’t get the clip to load in the theater. When I finally got to watch it, it wasn’t worth the time. No Avengers quality tease here. Just a faint glimpse at the Sinister Six, again, that only diehards will get anything from. Don’t waste your time.